Life requires balance. We spend a large part of our existence balancing our careers and our personal lives, our family and work obligations, and our own personal health. If something occurs that displaces one of the elements of our lives, we take action to bring it back into balance. The Earth is no different. Our planet uses carbon to regulate its temperature with three processes; the geological carbon cycle, the ice-albedo effect, and the biological carbon cycle. Before Earth had life, two main processes worked together as a thermostat to keep the planet in equilibrium; the geological carbon cycle and the ice-albedo effect. The geological carbon cycle acts over millions of years, slowly pulling carbon dioxide (CO2) from the atmosphere into the Earth’s mantle and then releasing it back into the atmosphere. The process begins when CO2 in the atmosphere combines with water to create carbonic acid, a weak acid that rains down onto the land. Carbonic acid gradually eats away at rocks, breaking them down into various atoms that are missing electrons, known as ions. Rivers carry these ions into the ocean where they readily combine with carbon already present, creating limestone, which sinks to the bottom of the ocean. As plate tectonics slowly renews the Earth’s surface, the ocean floor is forced down into the Earth’s mantle and the calcium carbonate is melted down. Active volcanoes later release this material and the CO2 in it back into the atmosphere. Where did the carbon in the shallow depths of the ocean originate? The ocean absorbs CO2 from the atmosphere using simple chemistry. When CO2 is dissolved in water, a hydrogen molecule is released. This hydrogen can react with some of the ions from chemical weathering to create bicarbonate molecules. The bicarbonate combines with calcium released during weathering to create calcium carbonate (i.e. limestone), which settles onto the ocean floor. A full turn of the geological carbon cycle happens on the order of a few million years. This process works in conjunction with the second ancient process, the ice-albedo cycle. Together, these two processes cause Earth’s temperature to oscillate between warm and cold periods. The ice-albedo cycle works much faster than the geological carbon cycle, on the order of tens of thousands of years. Like the geological carbon cycle, it is intimately tied to the Earth’s temperature. An object’s albedo defines how much sunlight it reflects, with a higher albedo meaning more reflection. Ice and clouds raise the albedo of a planet. If temperature decreases on Earth, causing the ice caps to grow, more of the Sun’s light is reflected back into space before entering the atmosphere. This means that the Earth’s ocean and land do not absorb as much solar radiation and cannot warm. This causes the Earth to cool further and increase the area the ice caps cover. Without the geological cycle to regulate this process, the Earth would be covered in ice. As the polar ice caps grow, more and more of the water necessary for chemical weathering is frozen. This halts the chemical weathering process, causing CO2 to build up in the atmosphere and trap the sunlight that is not reflected back into space. As a result, Earth begins to warm, melting the ice caps and liberating more water to be used for chemical weathering. Currently, volcanoes release up to 380 million metric tons of CO2 into the atmosphere per year. 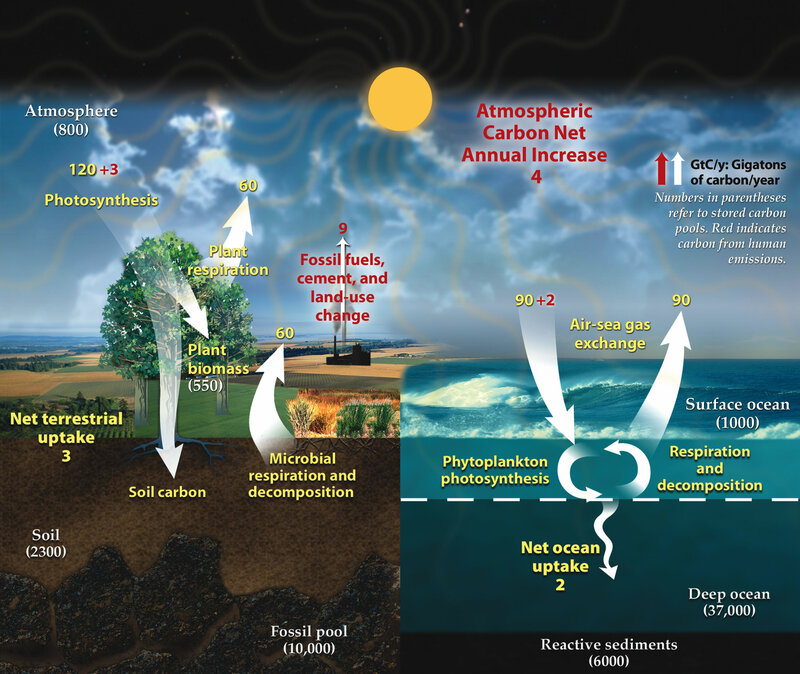 The amount of CO2 that is drawn out of the atmosphere due to chemical weathering depends on the rains but is not significant compared to the amount released and absorbed during the biological carbon cycle. Occurring on time spans that match our own, the biological carbon cycle is fueled by plants. CO2 from the atmosphere is combined with water during photosynthesis to create sugars and oxygen. These sugars are then broken down for energy by living organisms and fires. After the sugars are broken down and used, the remaining molecules recombine with oxygen to recreate water and CO2. The CO2 then returns to the atmosphere, and the cycle starts anew. During this entire process, 120 Gigatons of CO2 is absorbed from and reemitted into the atmosphere. This is approximately 1000 times more than the amounts discussed during the geological carbon cycle, and it affects the global temperature on much shorter and more noticeable timescales. These are the carbon cycles that were in place on Earth before the industrial revolution. Humans have added an additional cycle to the planet. We contribute to the carbon levels in the atmosphere through emissions, when we burn harvested carbon deposits like coal and oil. Currently, human activity is emitting 9 Gigatons of CO2 per year into the atmosphere through fossil fuel burning. Our carbon footprint is between the geological and biological carbon cycles and the Earth is struggling to use up the additional CO2 that we’ve put there. This extra CO2 is being absorbed by the oceans, causing them to become more acidic. It is causing plant life to decrease the number of stomata they grow, so they do not intake more CO2 than is necessary. The added CO2 is causing the Earth to warm faster than any of the more ancient carbon cycles can cool it off. Humans are now a significant CO2 contributor to our planet. Just as we maintain balance in our own lives, we must take steps to ensure that our contributions do not throw a wrench in the carbon cycles already in place on our planet.